We are in the home stretch this week as we wrap up week 4 of the Renovation Challenge. In our last visit to the homes of our 15 DIYers we spoke all about how to demo, prep and select your tile. This week, we are sharing tips and tricks on all things tile from each of our designers. Amanda of A Crafted Passion shares kitchen backsplash ideas to compliment white cabinets. “Speaking of the tile backsplash going in this week…the tile we got from Jeffrey Court has been sitting in the corner of my living room and I have been dying to show it to you in person. You guys, It’s gorgeous! Like, literally perfection,” said Garvin. Jenna of Jenna Kate at Home, gives a step by step tutorial on removing tile and patching her wall space to make way for her beautiful new kitchen backsplash. Before her beautiful new baby arrives. 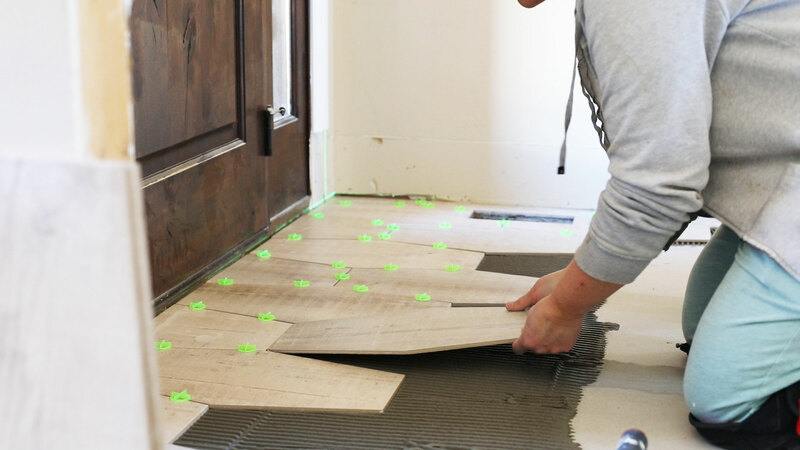 Amy of Her Tool Belt shares a great how to, for laying floor tile, installing wall tile and a little side project to help break in your tiling skills. Showing that tile doesn’t have to be boring if you’re working on a flip, Jennifer from Bachelorette Pad Flip shares great advice on selection tile and things to consider to still appeal to the masses. Thinking about a decorative patterned tile? Kristi of The Pickled Rose talks about her selection, best practices and install tips. Love Your Abode’s Yuni talks all about laying out field tiles before you install to see what pattern you like and what works best for the size and shape of your room. We’ve also been getting a lot of fan questions about tile that looks like wood and with so many great options, we are excited to have Liz of Franc and Eli share her inspiration with one of our newest additions to the wood tile family, Cabin Fever. “This tile is even prettier in person – I love the color and the nod to nature with the tree trunk cross-section style of the tile,” said Liz. Get your notepads ready as we dive in to soak up all the tips for all things tile with our judges. Be sure to check out the progress from all 15 DIYers in Season 3 of the Renovation Challenge and be sure to cast your vote today. Renovation Challenge Week 3: Let the Tiling Begin!